The bifold PLUS five pane folding door is available in four schemes, with prices starting from £2360, subject to size and specific design. To configure your choice of door, complete the form below and add to basket for your final price. For help read the technical data, which appears when you select an option below, or hover over the information icon, or for the full A-Z and CAD drawings select from the blue technical tab at the head of the page. All products are viewed from the outside. 28mm Toughened Argon Filled Glass. Patented shoot bolt locking system into concealed track. 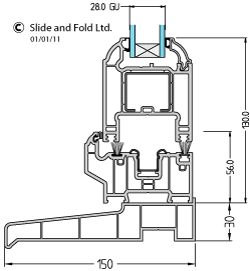 Small threshold height with option of low threshold for both open out and in doors. *For enhanced security handles both sides with secured by design locking system are fitted as standard. Sashes fully reinforced with galvanized steel. Slide and Fold bi fold PLUS doors are carried on patented concealed hinge bogie wheel sets. Co extruded low level sight line gaskets. For ease of fit the frame is made in one. Unlike some of our competitors our doors are made to measure. They are fully fabricated and assembled then individually tested. After final inspection the sashes are removed from the frame for ease of transport. The height is determined by your threshold detail. You can either have a standard pvc threshold or an aluminium low threshold. With either option you will need to consider where the threshold will finish in relation to your finish floor level, which includes your final floor covering e.g. laminated floor, carpet tiles etc. The maximum height for bifold PLUS doors is 2250mm. 3 doors slide from right to left viewed from the outside, with 2 opposing doors sliding to the right. The the traffic door is in the centre. Scheme 532 Bi fold PLUS doors are designed with external key locking access as standard. Secured by a shootbolt locking system and claw locking system. Available Open In or Out. 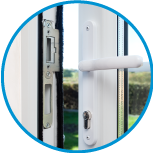 Open out doors have patented C pull handles for ease of use as standard. Fully reinforced with galvanized steel. For ease of fit the frame is made in one piece. 2 doors slide from right to left viewed from the outside, with 3 opposing doors sliding to the right. The the traffic door is in the centre. .
Scheme 523 Bi fold PLUS doors are designed with external key locking access as standard. 4 doors slide from right to left viewed from the outside, with a fixed door to the right. The fixed door acts,as the traffic door. Scheme 541 Bi fold PLUS doors are designed with external key locking access as standard. 4 doors slide from left to right viewed from the outside, with a fixed door to the left. 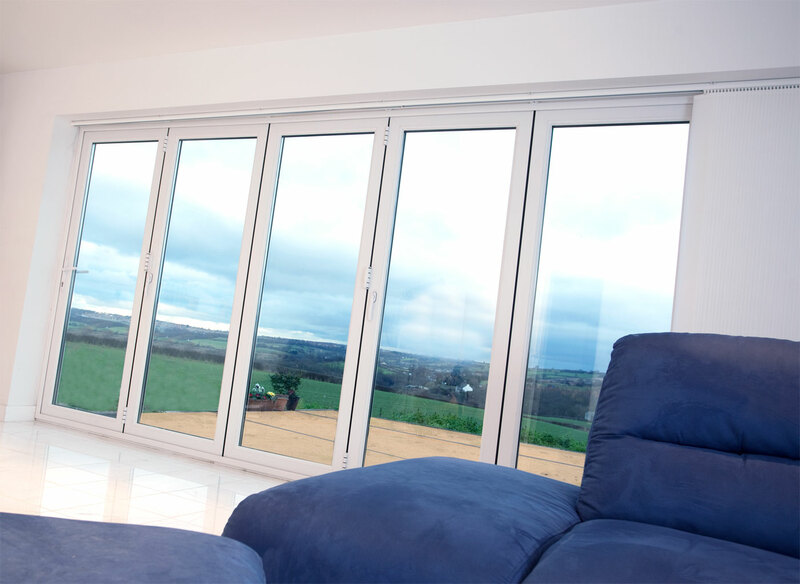 Scheme 514 Bi fold PLUS doors are designed with external key locking access as standard. This style is not available in the bifold plus range. For this style please choose from the standard UPVc door or the TECTura aluminium door. Min: Width=3050mm. Max: Width= 4500mm. To arrive at the correct price you must select the correct size range e.g. door width = 3725mm , the size range = 3651mm to 3800mm. Q: Can I couple a window to the top of the door? A: No. A steel lintel must be installed above the door, then additional glazing can be fitted above the lintel. Q: Can I install a door in a conservatory? A: Yes, subject to confirmation from Slide and Fold Ltd. Please do not order a door until you have verified with a slide and fold representative, the size of the door, type of conservatory frames and roof system. For very large doors the door must be fitted within a structural goalpost, that is capable of supporting your roof and the load of our doors. Please seek our advice. We highly recommend that you consider our window frames and roof system, as they are designed for this purpose. Five pane bifold plus doors are available in White only. For additional colours in this size range please choose from the four pane TECTura aluminium door and the five pane TECTura aluminium door range. Doors require room space when open. 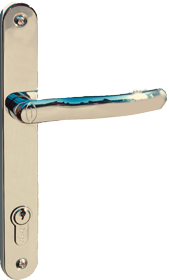 Due to the way doors stack on open in doors there are more handle options available. Threshold can be buried to a maximum of 55mm, with an external cill. Low Threshold Option available. No internal room space required. Threshold can be buried to a maximum of 15mm. 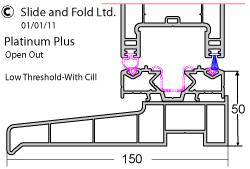 Low threshold is NOT available, choose the bi fold plus range if required. Open Out doors are 75% of all doors supplied. The industry standard is 150mm. A stub cill may be required if you have a small reveal or are sitting your door forward in the reveal and want to minimize the projection of the cill. 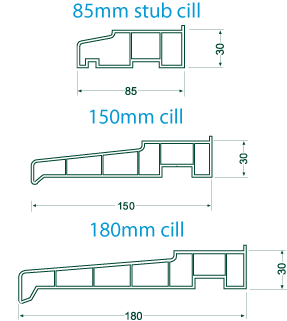 You may choose an 180mm cill if the door is sitting back in the reveal and you need to bridge the brickwork at the base of the door. On Scheme 532/523 the centre traffic door has handles both sides fitted, which operates a claw locking system. 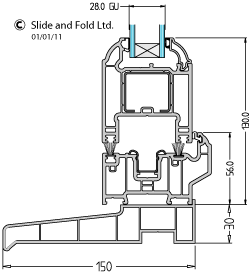 The first and last door have a low line handle, to the inside only, operating a shootbolt locking system. On scheme 541/514 the the traffic door has handles both sides fitted, which operates a claw locking system. The other two other doors have a low line handle, to the inside only, which operates separate shootbolt locking system. On scheme 550/505 the traffic door has handles both sides fitted, which operates a claw locking system. The other two doors have a low line handle, to the inside only, which operates separate shootbolt locking systems. Handles are the same for design for both open out and in doors. All our doors are made to such a high specification, they automatically conform to the current building (PART L) regulations. The only other consideration is if trickle ventilation is required. If you have no other means of venting your room ( i.e. 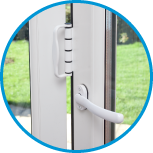 a brick vent, mechanical ventilation or another door or window with a trickle vent fitted) then a trickle vent will need to be fitted to your bi-fold door. If a trickle vent is required it will be fitted to the top of the first and last door sash. If you are replacing an existing door and not changing the structural width of your opening then building regulations do not apply. If the door you are replacing has trickle ventilation already fitted, then it is a requirement that a trickle vent is fitted to the bi-fold door. We have been supplying the UPVC Bifold Plus door since 2012. This is a tried and test door system. We now offer at an additional cost an enhanced Modlock system. The sightlines and profile dimensions remain the same, with the exception of the PVC threshold which is 8mm higher. Please follow link for detailed information. Door sashes have three internal chambers. Traffic Doors retained open with UPVC catches. Our glass conforms to building regulations as standard. 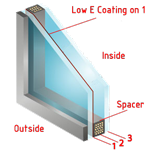 However you can configure the choice of Low 'E' coating (1), Spacer Bar (2) and internal glass type (3). The lower the 'U' Value the higher the specification combined with lower energy costs and comfort. For more information and "U" value certificates click here. Self-cleaning glass uses a microscopic coating with a unique dual-action. The first stage is "photocatalytic" - the coating reacts with daylight to break down organic dirt. The second stage is "hydrophilic" - instead of forming droplets, rainwater hits the glass and spreads evenly, running off in a "sheet" and taking the loosened dirt with it, also drying quickly without leaving streaks. Solar control glass can be used to minimise solar heat gain and help control glare. In temperate regions, it can be used to balance solar control with high levels of natural light. 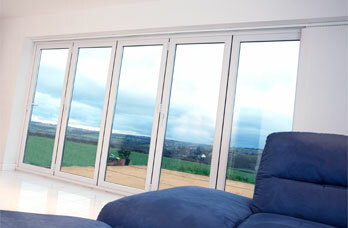 Solar control glass is ideal for large folding doors where solar heat gain could be an issue. This attractive blue glass ,combines dual-action, self-cleaning properties with solar control performance for a cooler internal environment. 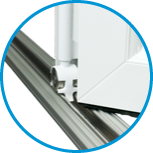 Specially designed for the optimum unit ideal for folding doors. It uses daylight and rainwater to breakdown and wash away organic dirt from exterior surfaces. 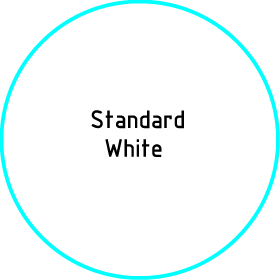 Its unique blue colour also helps keep internal temperatures cool whilst still maintaining excellent light transmittance. If not advised otherwise we will manufacture to our standard layout . Our blinds are the industry leading ScreenLine design, direct from Pellini in Italy. Available in ten colours, they are simple, quick and easy to use. More colours on request. Controlled by a manual cord. Current delivery on integral blinds is now only two to four weeks. 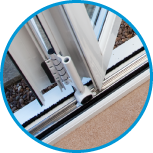 We highly recommend using our own fixing kits, when installing our Slide and Fold doors. It includes the exact same fixings,drill bits, and sealants that are used on our installations. 2 x Jobber Size x 6.5mm HSS Drill Bits. 1 x 6.5mm x 150mm Masonry Drill Bit. 20 x 7.5mm x 70mm Screws. 15 x 7.5mm x 80mm Screws. 10 x 7.5mm x 90mm Screws. 1 x Torx Driver Bit. 3 x Tube of Dow Corning Silicone. Although our doors are extremely easy to fit we also offer a full installation service, for full peace of mind. The cost on a 5 Pane door with no survey is £550 or £700 with a full survey included. Before ordering a door with an installation service, you must first be advised that we will undertake your order, by a slideandfold.co.uk representative. You will be given a reference number to validate your order. You will need to e-mail sales@slideandfold.co.uk digital pictures of the front and side access of your property. Plus images of the outside and inside view of where your door is to be installed.